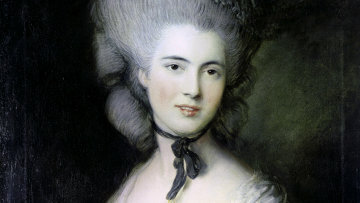 Designer prohibited from using Gainsborough's Lady in Blue | Russian Legal Information Agency (RAPSI). ST. PETERSBURG, February 27 - RAPSI. The Commercial Court of the Stavropol Territory has ruled in favor of the St. Petersburg State Hermitage Museum's lawsuit against fashion designer Iya Yots, prohibiting her from using Thomas Gainsborough's Lady in Blue in her designs, the Supreme Arbitration Court said on its website. Ms. Yots has been prohibited from using the image without the permission of the museum. The reasons behind the decision have not been disclosed. The designer's representative has previously declined to comment until the end of the litigation. The Hermitage representatives were not available for comment. The "Portrait of a Lady in Blue" by Thomas Gainsborough was bequeathed to the Hermitage by Alexei Khitrovo and was given to the museum in 1916. It is the only example of the English artist's work in Russia. Some art historians believe that it is a portrait of the Duchess of Beaufort. Iya Yots is a St. Petersburg-based fashion designer from the Stavropol Territory. 12:41 27/02/2013 The Commercial Court of the Stavropol Territory has ruled in favor of the St. Petersburg State Hermitage Museum's lawsuit against fashion designer Iya Yots, prohibiting her from using Thomas Gainsborough's Lady in Blue in her designs.